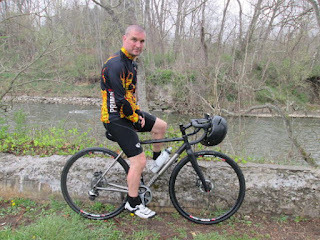 Tom Wiseman is a bike mechanic and our Bicycle Fit Specialist at the Century Cycles store in Medina. He purchased his Foundy Overland Ti in the fall of 2015 while attending an open-house event at Quality Bicycle Products (QBP) at their warehouse in Lancaster, Pennsylvania. QBP is the distributor of our popular Surly Bikes and Salsa Cycles, and Foundry is another of their in-house bicycle brands. The bike features a titanium frame and carbon fiber fork with with tapered steerer tube. Q. What made you choose the Foundry Overland Ti? A. I had been saving up a bunch of high-end parts to use on a gravel/winter bike. I was planning to put all the parts on another Raleigh frame (my main road bike is a Raleigh), but was waiting for it to become available. In the meantime, I test-rode the Foundry Overland Ti at Biketoberfest [the QBP open-house]. The one I test-rode was a small frame, which was actually a little too big for me. The QBP rep happened to mention, "Well, we do have ONE extra-small frameset still available." They were able to make me a good deal on it, so I snagged it. A. Shimano Dura-Ace Di2 electronic drivetrain, with matching shifters, derailers, crankset, and road hydraulic disc brakes, Stan's NoTubes Grail wheelset - set up with Hutchinson Intensive road tubeless tires. Q. What kinds of rides do you take it on? A. Technically, it's a gravel bike--taller and less aggressive geometry compared to a cyclocross bike, but it would be no slouch on a cyclocross course. I'm using it as a gravel bike/any-road bike/bad-weather bike/winter bike. So, I take it out on long training rides when I never know what the road or the weather is going to throw at me. Q. How does it ride? A. 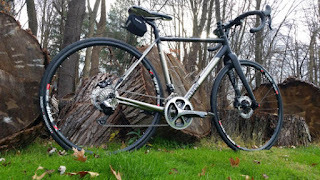 It rides exactly like you'd expect a titanium bike to ride, which to me is a good thing. Not quite as smooth as carbon, but more quiet and sure-footed. A "point-and-shoot" kind of feel--it's going to go where you want it to go with no surprises. Q. Any other thoughts on the bike? A. The bike is a mechanic's dream--no cables to adjust; ride, wash, lube, and repeat. In fact, I just got back from the new trail up at Hampton Hills Metro Park on it. Have not found anything yet I can't point it at and ride.